She sounded calm, cool and collected. Maria Shriver, California’s former First Lady, placed a 911 call reporting that her youngest son was seriously hurt following a boogie boarding accident last weekend. “What’s the emergency, ma’am?” asked the 911 operator. Christopher Shriver, the youngest son of Maria Shriver and Arnold Schwarzenegger, is recovering in a hospital after suffering multiple injuries including a collapsed lung. A just-released 911 call from Maria Shriver reveals a calm and cool mom trying to help her injured son. The accident happened during Carmageddon weekend at Escondido Beach in Malibu. Christopher has been in the hospital ever since… being treated for a collapsed lung and broken bones. He was visited by his father, Arnold Schwarzenegger Friday. His mother, Maria Shriver, has been by his side since the accident. 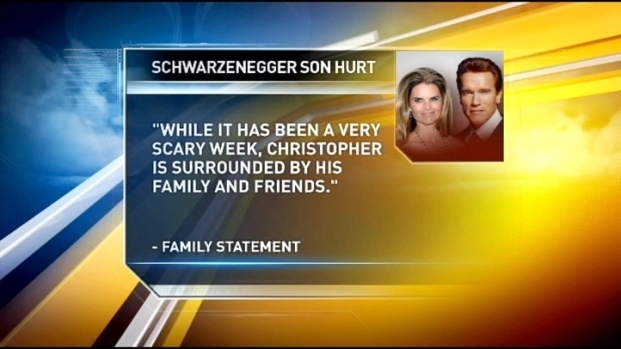 Christopher Schwarzenegger is expected to make a full recovery according to the family’s statement.